Everything about Butternut squash just screams winter to me...does anyone eat Butternut Squash in the summer? This Cheesy Bacon Butternut Squash recipe from Lou Lou Girls is the perfect warm and cozy side dish. 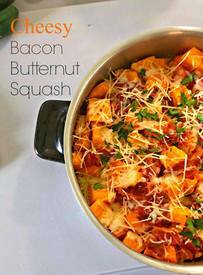 With the squash and bacon combination, it is almost a full meal! The squash is so buttery and then you take a bite of bacon and it’s over the top! Your family will be gobbling up seconds! !